- (In electronic commerce and online advertising, a brand advocate is a person, or customer who talks favorably about a brand or product, and then passes on positive word-of-mouth (WOM) messages about the brand to other people. You may have some social media fans who are more than happy to advocate your products within their own networks. Nurture those relationships so those fans continue to promote your brand to their social following. Even something as simple as favoriting their comment will indicate to them that you really care about the work they’re doing. Just like monitoring for brand and product mentions, it’s possible to monitor social media feeds for prospective customers by tracking keywords that signal purchase intent. For instance, a Chicago hotel company could monitor social for messages that say “vacation in Chicago” and reach out to those users with an exclusive offer. 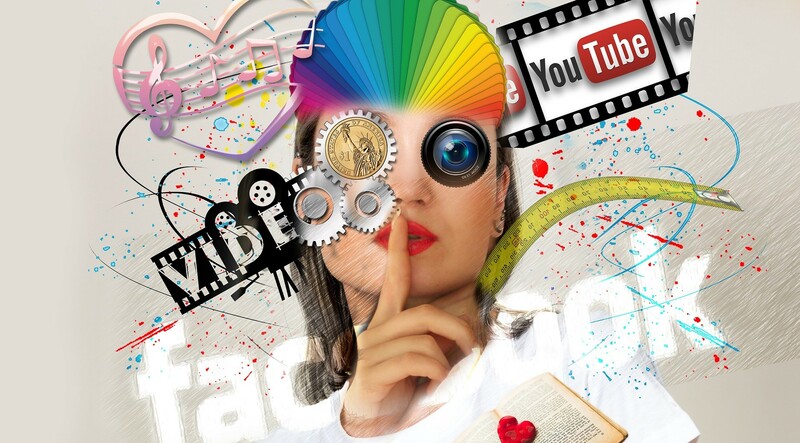 Social media is one of the most dynamic industries out there. Networks are constantly popping up, shutting down and releasing new features. That’s why it’s important to spend some of your day catching up on industry news and best practices (kind of like what you’re doing now). This industry is lucky enough to have some amazing resources online. Social Media Today breaks most of the social media news. Social Media Examiner sources strategies from top thought leaders. Adweek’s SocialTimes combines breaking social news and insights. Sharing content is the most fundamental thing you can do on social. While we believe engagement is key, you have to create and post content or you’ll likely see a significant lack in social activity. Take some time to sit down and focus on scheduling social posts, and you can line up entire weeks of content in no time at all. Remember, not every social network requires you to post content as frequently as others. Social media managers interact with customers more than most other departments. As such, this role requires taking the time to get familiar with products so managers can successfully navigate conversations with customers. Every company should be mindful of their competition and social media is a good way to get a quick view of what you’re up against. Try looking out for recently released products, what your competitors’ customers complain about or find unique marketing strategies that you can adapt to match your own campaigns. It’s great to do something that helps develop your own personal brand, especially since every social media manager has a unique perspective they can write about. Try writing a blog post for your company’s site, or for an adjacent site in your industry. You can then use this new article as a piece of content to share with your social media following. Almost every industry out there has thought leaders. These are the folks leading their specific market with the latest tips, tricks strategies and advice. It’s great to get yourself in front of the thought leaders in your industry so they may mention you to their large following. Some companies work closely with other brands on content like events, webinars, eBooks and podcasts. If you have partners like this, it’s always good to interact with them on social in order to grow that relationship. Social media is a team sport. Those working at agencies need to navigate with account managers for each specific company. Specifically for small medium-size companies, there can be several people working on a single social media profile. Take some time to chat with your co-workers about what you’re seeing and how you can best tackle issues that arise. To figure out what will perform best in the future it’s key to look at what has performed well in the past. Use a social media analytics tool to figure out what kind of content resonates with your followers, which networks perform the best for your team, how quickly you’re responding to inbound messages and much more. Then use that information to help plan for the future. One of the best ways to get impressions on your social media content is by encouraging your co-workers to share it across their social profiles. This lets employees share content with all of their friends and family members. Try an employee advocacy application to help streamline that process. This is similar to checking out your weekly social media analytics, except it requires you to dive much deeper into your metrics to see what is working and what you need to stop focusing on. We’ve put together a five-step process for conducting your own social media audit that can help you through the process. Part of being a social media manager is actually being social (go figure). It can be fun and productive to attend some local meet-ups to engage with other social managers in your area. The events don’t have to just be about social media either: try looking for some overall marketing or business events as well. Social media never sleeps: but that doesn’t mean you don’t have to. It’s possible to burn yourself out if you try to keep up with every single message sent to your pages. Train someone on your team to hold down the fort for a day or two each month so you can actually get some much deserved rest and relaxation. Most departments have a specific place on a business’s social media, and if you can get these groups on board, they can help lighten some of the social load. If you see a question come in on social, simply task it to the proper department and let them respond accordingly. Finance can answer questions about billing. HR can answer questions about job openings. R&D can answer questions about new products. Set goals each quarter so you know if you’re performing up to your own expectations. If you’re exceeding the goals you set for yourself, create new objectives that continue to challenge you to perform well. If you didn’t hit your goals, revisit where you fell short and analyze what went wrong. After you’ve looked at your goals, think about whether or not you’re tracking the proper metrics. There’s not much sense in continuing to hit and exceed your objectives if it turns out that those key performance indicators don’t make much of a difference on your company’s bottom line. Did you have trouble keeping up this quarter? Even if you managed to stay on top of things, you might have missed some things you wanted test out, but didn’t have the time. If that’s the case, it could be time to think about bringing someone else onto your team to help. Check out how SMF360 reach out to us. Get focus. If you hadn’t noticed, we here at SMF360 Social like to provide you with the best tips and advice on all things social. In fact, we have our own social media management and engagement platform that we believe is an amazing fit for social media managers learning from this post. Our full suite of tools makes it easy to engage, analyze, publish, report, and do so much more with your social media. This makes it easy to quickly check off to-dos from your list. Give it a try completely free for 30-days and see if it’s a good fit for you! 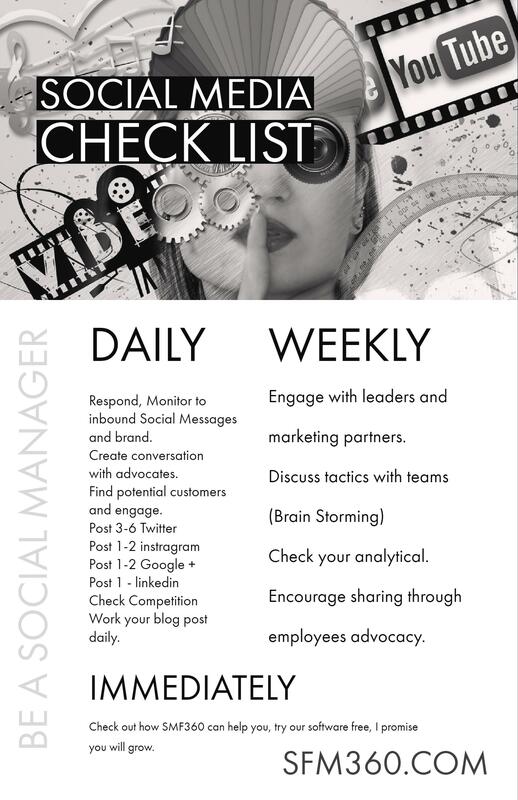 What would you add to your own social checklist? Tell us in the comments so that the next time we update this, it will include everything an active social media manager could ever want. ⟵3 Marketers Hacks to Grow your Business, If no you have no business.